“Any cause needs a price, and Shiva paid by years; 13 years of relentless search and long distances roamed”. This may be one of the most breathtaking stories of animals’ sixth sense! A female cat called Shiva knew no road to giving up to find her mistress that had to leave her with another family due to cancer. Shiva’s love and devotion to her mistress and the hope to meet again was the relentless emotional motive to clear away any obstacles between her and her sacred cause. Any cause needs a price, and Shiva paid by years; 13 years of relentless search and long distances roamed. “I have always believed in the sixth sense of animals. But there ..., says Mina el Bouali, still surprised by this story”. At the end of November 2016, the cat Shiva found his mistress after thirteen years of vagrancy. The animal traveled sixty kilometers between her former home and Colmar (Haut-Rhin), where her owner now resides. "I have always believed in the sixth sense of animals. But there ..., "says Mina el Bouali, still surprised by this story. 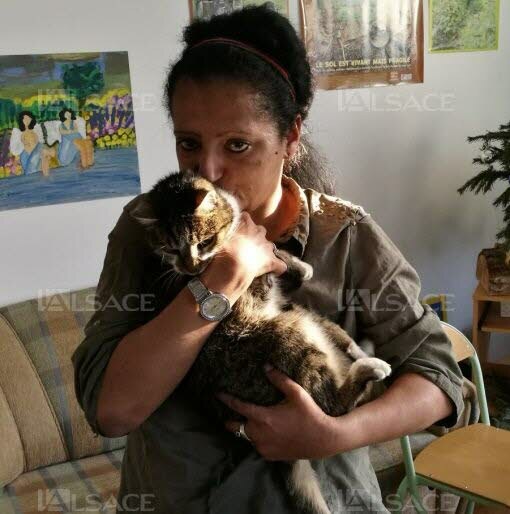 In 2002, while still living in Saint-Louis (Haut-Rhin), the young woman, an activist of the animal cause, saved and adopted three kittens: Shiva, Bianca and Sheitan. But in 2003, as she got unfortunately assaulted by cancer, she had to say three felines farewell, leaving them with a family. “She did not recognize Shiva and took the animal to the vet who informed her that the cat was hers”. The story could have come to an end there. But in November 2016, a cat came to knock on her door. A female, very thin with a distorted tail. She did not recognize Shiva and took the animal to the vet who informed her that the cat was hers. The couple with whom she had left Shiva reported the cat to run away a month after her arrival. "With these thirteen years of vagrancy, I have 100,000 questions in my head ...", says Mina. The mystery remains, but does not prevent the courageous cat from sinking happy days at its owner: "I will offer her the best possible treatment!"